This year Hannah decided not to have a a regular birthday party. So instead we invited Anton and Lea for a visit to the Technical Museum in Stockholm for the day. Their parents dropped them off at 9:20 am and they stayed with us until 3 pm. We took care of the whole day with museum visit, lunch and fika*. 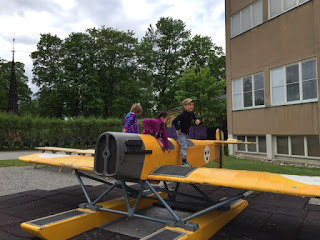 Outside the museum they have this plane that kids are allowed to climb on. This was combined with a short snack to tie them over until lunch. Then we got inside and started to check out all the stuff they have there. 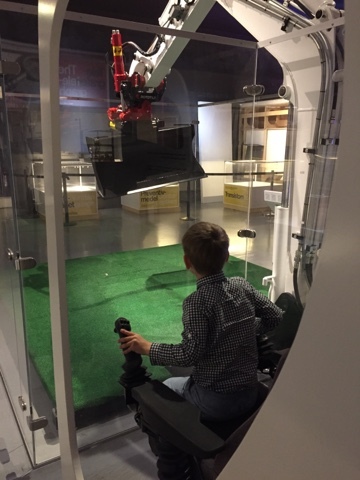 The first favourite was the tractor simulator where you can move the digger. Here is Anton trying it out. Pretty soon we made it the the kids area and spent most if the time until lunch there. Highlight here was this. After a lunch of pancakes for the kids and something good for the grown ups it was back to exploring the exhibits. At this time the had one called Digital Revolution the showed the evolution of computers and computer games. It was nicer for someone like me than 6 year olds, but we soon found the mine exhibit and walked around some mine shafts from different ages. 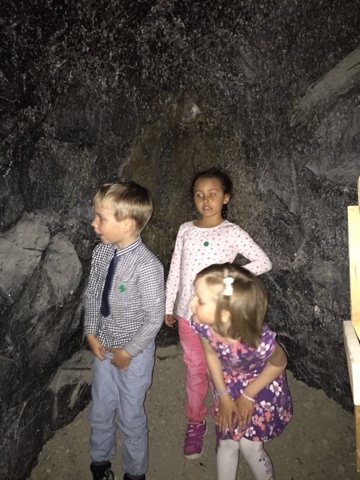 The three mischief's in the mine. We all had a great day and I think all fel asleep pretty easy that night. * Fika is Swedish for coffee break.